Peterborough mortgage rates mortgage rates tend to be average versus other Ontario cities. The following are the lowest rates from providers with offices in or close to Peterborough. For out-of-town providers check the best rates in Ontario. 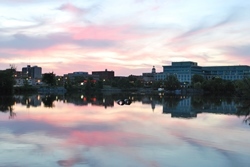 City in Brief: Peterborough is located in Central Ontario and is known as the gateway to the Kawarthas, or Ontario’s cottage country. The city also earned the nickname “The Electric City” due to the fact it was the first town to use electric streetlights. The Trent Canal runs along the eastern side of the city, making it an important stop for boaters traversing the waterway.